The courses are on-going offers from individual trainers, and cost €13.00 per participant. There is also a 10-Class-pass available for €100 that gives the holder access to all available courses at the same time. The courses take place between 18:15 and 20:15, although are occasionally held in the morning. Analyzing the importance of the spine in connection with the center and the body extremities, as well as the importance of being conscious of movement vectors, we will play with level changing, weight transfer, spatial awareness and energy management. What do we have to release or how do we redirect the energy of the movement in order to find a momentum? How to navigate between higher and lower levels – going in and out of the floor- using minimum effort? The classes are developed through very physical and dynamic choreographic compositions. This course is aimed at people who want to broaden their handstand horizon, whose static handstand training lacks a dynamic component and at those who simply want to move a little differently. It includes warm-up, static and dynamic pre-exercises, technique training, strength training and stretching. Various ascents and descents are trained (such as backward roll-to-handstand, makako-to-handstand, handstand-1/2-turn-roll, handstand-to-KipUp) as well as the classic handstand. A further focus is on learning correct and safe spotting as well as their application during the lessons. For a more balanced and effective training I also offer an static handstand training on Friday. Same time, same space. 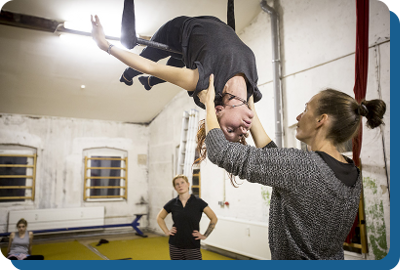 In her trapeze class, Jana pays special attention to breathing techniques, momentum and beats, inner strength, and ergonomic training. The class is open to all levels. She rather focusses on basic details and aerial body knowledge than teaching tricks. This class is suitable for people who are interested in learning the basics of aerial silks as well as for those who are advanced and want to focus on transitions, creativity and expression in the air. This class explores the body’s gravity and center as a starting point for the movement. We use strengthening elements and release based exercises through movement structures. We also play with level changing, weight transfer, spatial awareness and energy management by using floor work. What do we have to release or how do we redirect the energy of the movement in order to find a momentum? How to work the connections and transitions from one movement to another, allowing the body to pass from flowing to fragmented qualities? Energy managing tools will be taught as a way to improve the ability of spending only the necessary amount of energy in order to perform certain movements. This training requires physicality and aims to create an opportunity for the body to fully express itself. For dancers, performers, acrobats and anyone interested in moving. This trapeze class is open to everybody. We work on basics as well as on little sequences. Main focus of this silks class is: basic body and movement knowledge for aerial and upside-down work, silks logic, and precise details. This provides the ability to create own choreographies and broadens the repertoire of tricks. This course will focus on the fun part of standing acrobatics: easy lifts, nice flows, hand-to-hand, pitching, group work, etc. But this does not mean we‘re only working on standing acrobatics. Remember: Low is for pro, high is for show. This means we will always start the class with the basics in L-basing (foot/hand-to-hand variations) to learn the right technique. Another aspect of the class will be to work on easy sequences to slowly build up the strength, body awareness and trust. This handstand class is aimed at beginners as well as advanced people. while the exercises changes regulary the structure stays the same. It includes warm-up, tension exercises, technique training, strength training and stretching. With constant participation, body tension, coordination, balance, strength and stretching will be improved step by step and qualifies you to do a safe and healthy handstand. With the advanced students I am working on various figures, press-up and one-arm techniques. For those who prefer to drink beer on Fridays, who are impatient or simply want the complete program I now offer an additional Monday class. Same space, same time, new tricks. This weekly class is specially made for movers that have a wish to incorporate acrobatic elements. It is designed to develop strength, understand mechanics and combine different technics. My approach will encourage you to take some risks and build a base to eliminate unnecessary fear. Movements will be broken into steps, respecting your stage and developing progressively. This class will give you the possibility to fall and make mistakes without hurting. The practice uses spotters and mats until you are safe to do it alone. Power moves are exciting! I expect you to be curious and open to explore them. Open for everyone familiar with movement, performing or practicing sports is welcome to join.